See the SILIS group publications highlights page for leading articles on these generation techniques (laser wakefield acceleration, target normal sheath acceleration, radiation pressure acceleration, FEL action, harmonically driven betatron radiation generation). The SILIS group at the University of Strathclyde is established as one of the largest laser-plasma research groups in the UK. Our experimental and theoretical research is wide ranging across the field of laser-plasma interaction and is also integral to several UK and Europe wide collaborations. 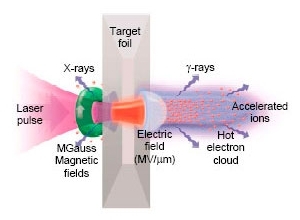 The Advanced Laser Plasma High-Energy Accelerators towards X-rays (ALPHA-X) project is developing laser-plasma accelerators for the production of ultra-short electron beams as drivers of incoherent and coherent radiation sources from plasma and magnetic undulators. In addition to its usefulness as an injector for accelerators or radiation sources, ultra-short electron bunches have numerous direct applications such as in ultrafast electron microscopy, pulsed radiology and time-resolved electron diffraction. Ultra-short radiation pulses are essential for time-resolved studies in a wide range of applications across many branches of science, engineering and industry. Notable achievements have seen the production of stable, high quality 100-150 MeV electron beams with very narrow energy spread and low transverse emittance. Ground-breaking experiments into radiation source development have seen the first demonstrations of LWFA-driven synchrotron radiation from a magnetic undulator (using the Jena JETI laser) and gamma-ray betatron radiation (using the Rutherford Appleton Laboratory Astra Gemini laser). The Advanced Strategies for Accelerating Ions with Lasers (ASAIL) project, led by Queen’s University Belfast, is developing high power laser-driven sources of protons, ions and gamma rays. It aims to provide compact and flexible sources with optimal properties for use in industrial and medical context. The specific objectives for the project are to develop the relevant technology for high-flux, high-repetition source delivery and characterisation. These will be achieved via a combination of innovative developments in target production and delivery, detector technology, beam property optimization and control. 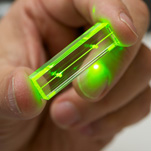 Experiments have been conducted at several worldwide laser facilities including Taranis at Queen’s, Astra Gemini and Vulcan Petawatt at RAL in the UK, J-Karen at JAEA in Japan, Brookhaven in the USA and LULI in France. Several high profile publications have been produced, including work on diffraction-limited performance and focusing of high harmonics from relativistic plasmas. 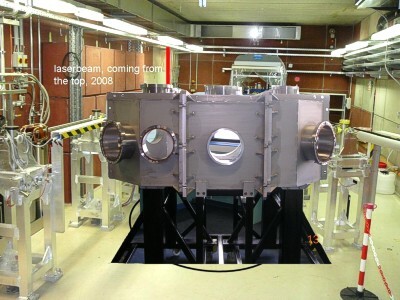 The Strathclyde–Dresden Laser Driven Applications (S-D LDA) programme has been established at the Helmholtz-Zentrum Dresden (HZDR) coupling a 150 TW laser to a 40 MeV linac. The aims include production of monoenergetic proton beams of about 20 MeV and monoenergetic heavy ion beams with specially manufactured targets and production of up to 40 keV backscattered monoenergetic X-rays from laser electron beam interactions. 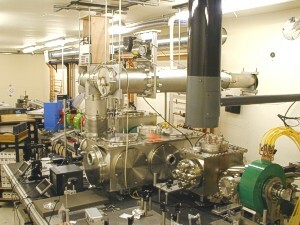 Ultra-high vacuum interaction chamber built at Strathclyde. In this project, a short seed pulse is injected into a preformed plasma waveguide channel where it is amplified by a counter-propagating, high energy, long duration chirped pump pulse. Energy is transferred from the pump to the seed by resonant excitation of a plasma wave. Not only does the Raman amplification mechanism represent an extremely interesting new scheme to amplify short laser pulses without the need of using a stretcher and a compressor, but it can also have important implications for particle acceleration since it could provide a means of energy replenishment for the main short laser pulse. It could therefore play in a role in the staging of multiple accelerating structures. Recent experiments have seen an energy gain of 400% over the full spectral bandwidth while preserving the seed pulse duration. Initial and amplified seed outputs. SCAPA: We provide radiation detectors for beam characterisation, and lead a project investigating the use of high energy electrons for external beam therapy. SCAPA will also provide a welcome local test facility for our other detector developments. PANDA, FAIR, Darmstadt, GSI, Germany: PANDA is the planned anti-proton annihilation experiment at the forthcoming FAIR facility. Among other topics, it will search for exotic hadronic states. We are leading the design and development of the focussing disc DIRC for the target spectrometer. Detector development: Our group pursues a wide range of detector development projects. We are currently focussing on the design of very fast photon detection devices, and will bring our expertise in photon detection to the CLAS 12 RICH. This work has applications in medical physics. We have a track record in the construction of fast scintillation counters, scintillating fibre arrays and neutron detectors. This expertise has led to collaboration with the nuclear power industry. We will take advantage of the tremendous opportunities offered by the 12 GeV upgrade programme at JLab. In particular we will focus on hardware and software developments for Hall-A (Super BigBite), and components for the upgraded CLAS detector (CLAS12) such as the forward tagger and ring-imaging Cerenkov (RICH) detectors. 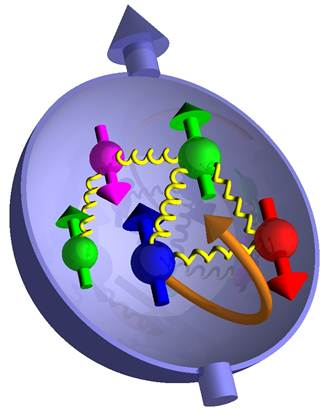 The study of nucleon structure is vitally important for completing our understanding of the transition between the hadronic and quark/gluon descriptions of nuclei. 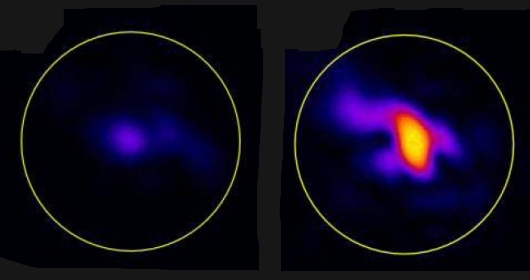 We will specifically investigate the internal landscape of the nucleon. The Glasgow group are prominent both in Europe and the USA, playing a major role in shaping the hadron physics programmes of the leading electron accelerator facilities. What is the mechanism for confining quarks and gluons in strongly interacting particles (hadrons)? Can we understand the excitation spectra of hadrons from the quark-quark interaction? Do exotic hadrons (multiquark states, hybrid mesons and glueballs) exist? All these questions address the need to understand the strong nuclear interaction at the energy scale of most of the visible mass in the universe. To do this, one needs to map out completely the spectrum of baryonic and mesonic states, and understand their properties. How do nuclear forces arise from QCD? What is the equation of state of nuclear matter? 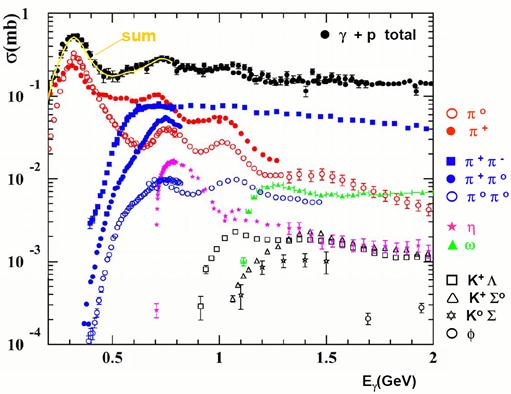 We carry out a range of investigations of nuclear structure which fall into three broad categories: Short-Range Correlations (SRC) of nucleons within nuclei, coherent A(γ, π0)) measurements of matter form factors of nuclei to determine possible differences in neutron and proton spatial distributions and photo-disintegration observables of few-body nuclei to test ab-initio calculations of the few-body nuclear wavefunction. The Edinburgh group has a diverse programme of research in nuclear physics including nuclear astrophysics, exotic nuclei, dark matter searches and hadron physics. For more details on our research please visit the weblink http://www.ph.ed.ac.uk/research/nuclear-physics.